Home » Because some things shouldn’t last forever. That’s why there’s laser tattoo removal! Because some things shouldn’t last forever. That’s why there’s laser tattoo removal! Maybe it’s a souvenir from a wild, crazy Spring Break, or an act done in a moment of rebellion, or it could simply be a reminder of a You from the past – whatever the reason it got there, it doesn’t have to stay there forever. Laser tattoo removal is a safe, effective way to remove tattoos of all kinds ranging from professional to amateur (homemade), even traumatic and surgical tattoos. Using specific wavelengths of light, the laser targets the different ink colors. Bypassing the skin and being absorbed by the ink, the light energy causes the tattoo ink to break into tiny particles which are then removed by the body’s natural filtering systems. 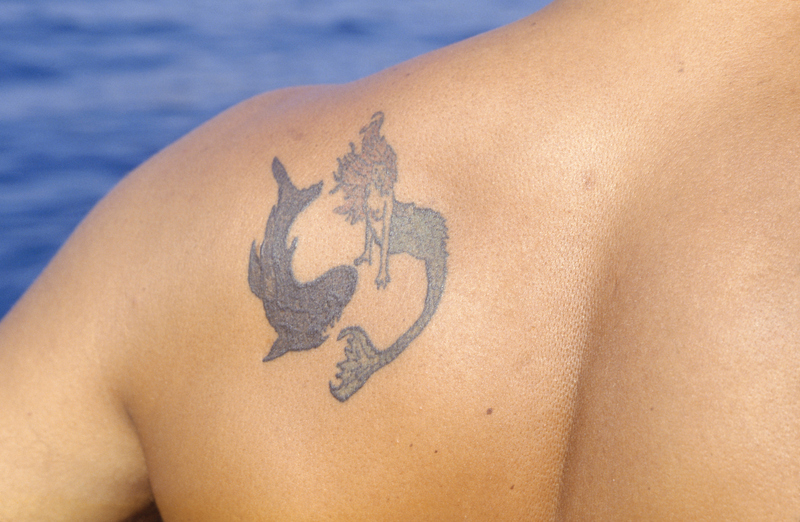 With this process up to 95% of the tattoo fades, often times it is removed completely. >One of the biggest questions patients ask is ‘Does it hurt?’ While it is different for every individual, the sensation resembles that of a rubber band snap or a light grease splatter on the skin. Pricing is the next question when it comes to laser tattoo removal and that depends solely on the tattoo itself. Factors considered are the size of the tattoo, where it is located and the colors of ink that were used. To assist with giving individualized pricing, we offer complimentary tattoo removal consultations with our Certified Laser Specialist, Lori Wrightington. After your treatment you will need to keep the tattoo covered and apply a petroleum jelly daily to help keep the treated area moist. You may notice redness around the tattoo and slight scabbing as the inks begin to break down into tiny particles. The skin surrounded the treated tattoo is left intact and only the tattoo itself is in a recovery state after the removal. Ready to say adios to that tattoo? It’s important to know that removing a tattoo doesn’t happen over night. A professional tattoo can require 6-8 laser removal treatments until full results are achieved. When it comes to specific ink colors, many would think the lighter the tattoo, the quicker it fades, however it is quite the opposite! Remember the laser targets the ink so the first colors to fade are the darkest such as black and deep, navy blue. Yellows and greens are often the last to fade during the removal process. To learn more about the process or have your tattoo evaluated for removal, schedule a consultation with Lori by calling 843-556-8886 or send us an email.